Soft cover, 233 pages, A4, includes 129 individual entries, photographs and index. 2009 marked the 150th anniversary of Queensland as a colony, separate from New South Wales. The vision for the Q150 celebrations was ‘reflect on our past, imagine our future’. Toowoomba & Darling Downs Family History Society Inc. received funding to publish this, the first book to record the stories of a small number of the men and women buried in what is literally, the society’s ‘backyard’. 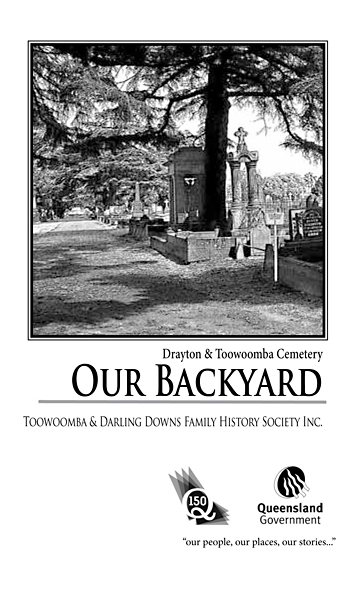 Since the 1980s, the society has amassed a large amount of material relating to the Drayton & Toowoomba Cemetery and the people buried there. Past President of the society, Mary Hollis, wrote ‘Situated approximately on the border of Toowoomba and Drayton (which was once a municipality) the cemetery’s original eight acres were surveyed and marked out by James C Burnett in 1850…this land was divided into seven sections…’. Today the cemetery more than doubled the number of sections. News, indexes and much more. NOTE If you find an entry of interest in our indexes, it is possible to obtain a photocopy of the article from the Society. Cost is $2.50 for the first image and a $1.50 for further images. There is a fee for the use of our research facilities at $10 per visit for non-members and $2.50 per visit for members. Available free of charge during our opening hours. This service is provided when the Drayton & Toowoomba Cemetery office is closed. © Toowoomba & Darling Downs Family History Society 2013. Last updated Mon 8 th May 2017. Many thanks to Kev Farmer/ APN for use of his photo in our header image.